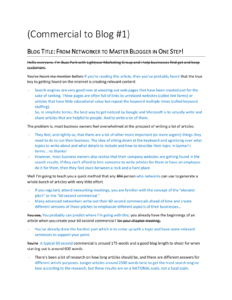 /From Networking to Blogging in One Step! From Networking to Blogging in One Step! If you attend networking meetings on a regular basis and are familiar with making short 60 second presentations or “elevator pitches”, then you can go from networking to blogging in one step (sorta). You can easily create valuable online content that will bring visitors to your website and position you as an expert in your field! You’ve probably heard that the key to getting found on the internet is creating relevant content. Search engines are very good now at weeding out web pages that have been created just for the sake of ranking. These pages are often full of links to unrelated websites (called link farms) or articles that have little educational value but repeat the keyword multiple times (called keyword stuffing). So, in simplistic terms, the best way to get noticed by Google and Microsoft is to write and share articles that are helpful to people. And to write a lot of them. The problem is, most business owners feel overwhelmed at the prospect of writing a lot of articles. They feel, and rightly so, that there are a lot of other more important (or more urgent) things they need to do to run their business. The idea of sitting down at the keyboard and agonizing over what topics to write about and what details to include and how to describe their topic in layman’s terms… no thanks! However, most business owners also realize that their company websites are not getting found in the search results. If they can’t afford to hire someone to write articles for them or have an employee do it for them, then they feel stuck between a rock and a hard place. You probably can predict where I’m going with this; you already have a great start for an article when you create your 60 second commercial! You’ve already done the hardest part which is to come up with a topic and have some relevant sentences to support your point. Since a typical 60 second commercial is around 175 words and a good blog length to shoot for when starting out is around 600 words, you’re already nearly 1/3 done! You can see the 60 second commercial timing sheet I used to jumpstart this article (See Example). I should note that there’s been a lot of research on how long articles/blogs should be, and there are different answers for different article purposes. Longer articles around 2500 words tend to get the most search engine love according to the research, but these results are on a NATIONAL scale, not a local scale. 600-800 words is the traditionally recommended length by many bloggers. This length is a good middle ground to get a good amount of comments by readers and social shares. You can read a couple great articles about blog length at thewritepractice.com and at Forbes. My personal opinion is that while this length (600-800 words) won’t necessarily help you get noticed on a national scale, it will help you destroy your local competition. You’ll be building valuable content for your website which WILL, over time, help you with search engine rankings. You’ll also significantly increase your social shares which will bring visitors to your site and as increasing your credibility as an expert in your field. In order to turn your 175 words into a good blog post, simply take your 60 sec commercial and add a couple amplifying sentences to each of the key points. 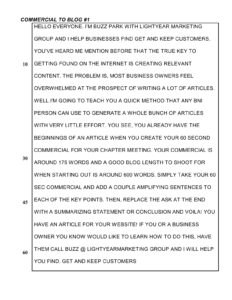 If you add 2 or 3 sentences related to every sentence in your elevator pitch (as I’ve done here. See Example) then you can very quickly come up with the desired length of article. Make sure you’re adding purposeful information, though. Don’t just add fluff to beef up the word count. If you want to supercharge your blog post, add an image that reflects the point you’re trying to make. Images always attract more attention that text-only. Once you’ve written the extra content for the body of the post, replace the “ask” at the end (of your elevator pitch) with a summarizing statement or conclusion. I don’t recommend that your article have as strong a call-to-action as your elevator pitch because the purpose is more educational in nature. It’s better to wrap up your article with an overall summary. Make sure your conclusion is clear; many of the readers may have just scanned the rest of the article and the conclusion may be the only paragraph they read completely. Now, sit back and pat yourself on the back; you have written an article for your website! But you’re not quite done yet… What do you do with that article? Do you just post it on your website? Do you send it out via email? Do you throw it up on LinkedIn and Facebook? There are a lot of ways you can use each of the articles you create. I will discuss that in a follow-on post about getting the most of every piece of content you create. In summary, if you attend networking meetings on a regular basis and are familiar with making short 60 second presentations or elevator pitches, then you are literally one step away from creating valuable online content that will bring visitors to your website and position you as an expert in your field. Going from networking to blogging is really that easy. All of which means you’ll get more business and help more people. You Wrote an Online Article…Now What? →← Lightyear Marketing Launches PriorityCom.com!